Northwestern University broke ground today on the latest addition to their downtown medical campus: a glassy, high-rise complex for biomedical research that architects Perkins + Will have previously described as “a high-tech loft.” The Louis A. Simpson and Kimberly K. Querrey Biomedical Research Center replaces Bertrand Goldberg's old Prentice Women's Hospital, which was demolished last year after a contentious preservation fight ended with the Commission on Chicago Landmarks voting unanimously to deny the building protection. 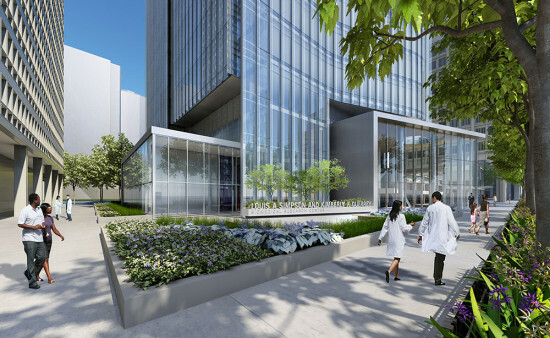 Part of Northwestern's Feinberg School of Medicine, the new 600,000 square foot, 12-story research center will include nine laboratory floors, and could eventually reach 1.2 million square feet with the addition of a 40-story tower in future phases of construction. Perkins + Will’s beveled, glassy facade looks likely to replace to a modernist icon whose long battle for preservation ended earlier this year. 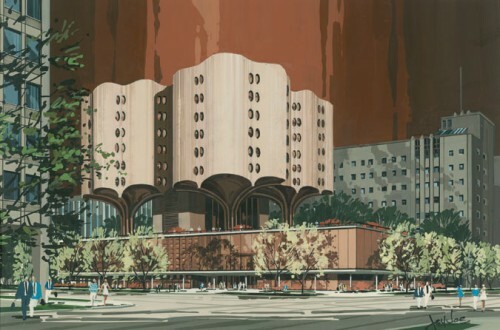 Last month Northwestern Memorial Hospital released three finalist designs for its new biomedical research center, the successor to Bertrand Goldberg’s partially demolished Old Prentice Women's Hospital. 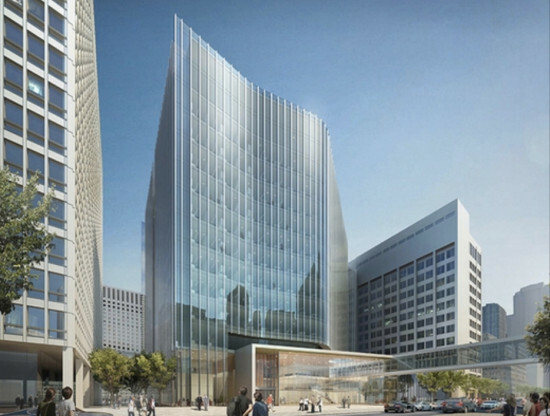 Northwestern spokesperson Alan Cubbage told the Tribune, “the combination of the elegant design and the functionality of the floor plans were key.” Construction on the $370 million project could start as soon as 2015, finishing by late 2018 or early 2019. Eventually reaching 1.2 million square feet, the medical research facilities would be built over two phases of construction, culminating in a 45-story tower. The cost of phase two has not been determined and would be in addition to the $370 million first phase. Community group Streeterville Organization of Active Residents (SOAR) last month laid out their hopes for a more "iconic" building than those proposed in an open letter to those involved with the project. The other finalists were Goettsch Partners, working with Philadelphia-based Ballinger; and Adrian Smith+Gordon Gill Architecture, working with Boston’s Payette Architects. An update to our story from yesterday: Northwestern University released many more images from the three candidates vying to build a successor to the site previously occupied by Bertrand Goldberg’s old Prentice Women’s Hospital. The new images include floor plans, interior renderings, and additional elevations of the three buildings. The three finalists whose designs now go to the Northwestern board of trustees for a decision are: Goettsch Partners and Ballinger; Adrian Smith + Gordon Gill Architecture and Payette; and Perkins+Will. Construction is expected to start in 2015, with the approximately 1.2 million square feet phased in over time. Prentice Women's Hospital, the building previously occupying 333 E. Superior St., was the subject of a heated and ultimately doomed preservation effort. Demolition on the distinctive cloverleaf structure began in October. Peruse the full galleries here: Goettsch/Ballinger; AS+GG/Payette; Perkins+Will. Amid the latest in a series of temporary reprieves, Bertrand Goldberg’s former Prentice Women’s Hospital was again denied landmark status by the Commission on Chicago Landmarks. Despite once again turning out a crowd of supporters who contributed hours of impassioned testimony, many preservationists were unsurprised by an outcome that they chalked up to political determinism. “I have this suspicion that [owner] Northwestern [University] has put before us a false choice,” said Commissioner James Houlihan, who nonetheless voted along with all of his fellow commissioners to deny the 1975 building landmark status. The commission Thursday reprised, in a way, a vote taken in November, in which they recognized the litany of evidence qualifying Prentice as an architectural landmark, voted to grant the building landmark status, and subsequently revoked their own decision in a second, almost unanimous vote. (The sole holdout during that vote, Christopher Reed, resigned at the end of 2012.) Their reason for doing so, said commission Chairman Rafael Leon, was a provision in municipal code that called on them to allow testimony from the city’s Department of Housing and Economic Development. The jobs and tax dollars promised by new construction, they concluded, outweighed the building’s architectural significance—logic that preservationists took issue with on several levels. In December the National Trust for Historic Preservation and the Landmarks Preservation Council claimed in court that the commission “acted arbitrarily and exceeded its authority,” when it denied the building landmark status by considering economic matters so prominently. Judge Neil Cohen dismissed that suit in January, but not without raising concerns over the commission’s transparency. “The commission maintains that it did not violate the landmarks ordinance or any other law,” Leon said when it came time to discuss Prentice. To show their methods were “beyond reproach,” he said, they would again hear public testimony. Jeff Case, a principal at Holabird & Root, was among the design professionals who opposed preservation, saying Prentice had “outlived its useful life.” “The building has moved on, and so should we,” he said. “333 East Superior will not be missed.” Carol Post of Thornton & Tomasetti concurred, citing structural problems in the building’s clover-shaped concrete shell. Still many more echoed the sentiments of an open letter signed in July by more than 65 architects, calling on the commission to reject the recommendation of the Department of Housing and Economic Development that previously swayed them to withhold landmark protection. “A Walmart will always generate more revenue than a water tower,” said Preservation Chicago’s Jonathan Fine. Christina Morris, a senior field officer in the National Trust for Historic Preservation’s Chicago office, similarly rebuked the commissioners for appearing to sidestep their civic duty. “You have an obligation,” she said, “to protect Chicago’s cultural heritage.” Since the commission’s November decision, preservationists have also attempted to meet Northwestern’s arguments on their own terms. 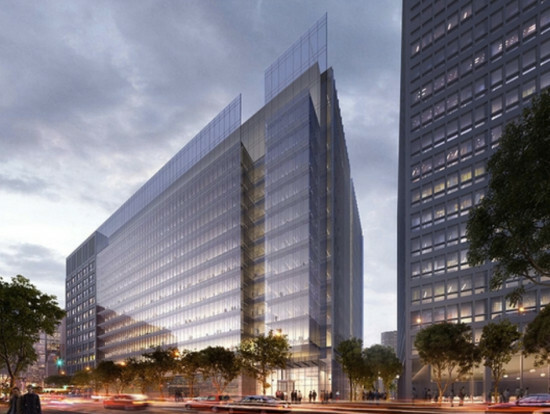 Architects submitted four proposals for reuse that also included new buildings to satisfy Northwestern’s stated development needs. They claimed saving the Goldberg structure would result in an additional $103 million in one-time expenditures, $155 million annually in operating costs, $1.1 million in yearly tax revenue, and create 980 new jobs. Northwestern dismissed those proposals Thursday in a statement that called their economic assumptions “deeply flawed.” The four alternatives were “not viable,” said Northwestern’s Eugene Sunshine, because of structural challenges presented by Prentice and because some of them relied on developing nearby vacant land not owned by Northwestern University, but by Northwestern Memorial HealthCare. Commissioner Houlihan asked Sunshine if it was disingenuous to suggest the sister organizations could not get together and work out a solution to that problem. Sunshine said it was not. Dean Harrison, president of Northwestern Memorial HealthCare, later testified that NMH had "long-standing plans" to build something else on the site, but did not provide a timeline for that development. Though Thursday’s decision could mark the end for preservationists in a long and heated fight, another court hearing is set for February 15. Architects to Chicago Mayor: Save Prentice! More than 60 architects flocked to the side of Bertrand Goldberg’s embattled Prentice Women’s Hospital Wednesday, calling on Mayor Rahm Emanuel to ensure the concrete cloverleaf’s permanent place in Chicago’s skyline. 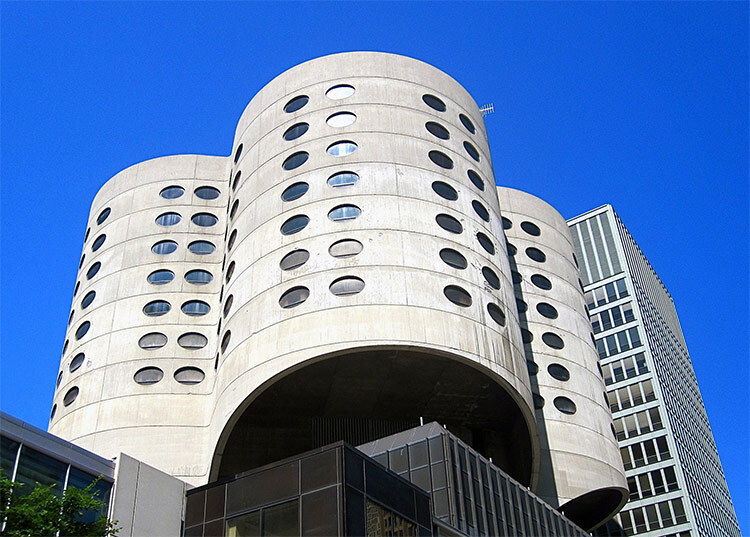 “The legacy of Bertrand Goldberg’s Prentice Women’s Hospital is unmistakable. 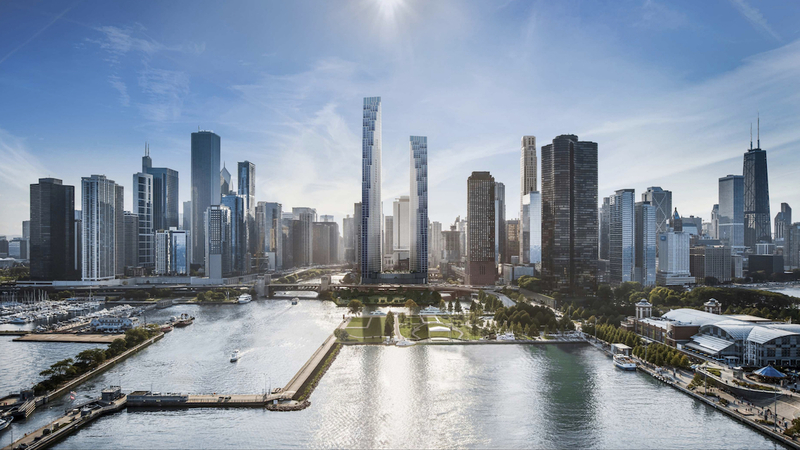 It stands as a testament to the Chicago-led architectural innovation that sets this city apart,” reads the open letter, whose cosigners include Frank Gehry, Jeanne Gang and the partners of SOM. “Chicago’s global reputation as a nurturer of bold and innovative architecture will wither if the city cannot preserve its most important achievements.” Northwestern University, Prentice’s owner, announced their intention to tear down the vacant hospital last year. But Alderman Brendan Reilly helped secure a stay of execution for the building, galvanizing a preservation movement that has earned the support of the Chicago AIA, Landmarks Illinois and AN's editorial page. Prentice Women’s Hospital moved to a new facility down the street in 2007, opening up the distinct building to arguments of functionality in a high-density neighborhood. Coming from a major research university, Northwestern’s demolition plans suggest preservationists stand in the way of progress. But a reuse study by Landmarks Illinois found rehabilitation as a lab, office or residential tower would take less time and cost less than new construction on the site. Preservation would also “provide visual relief,” they wrote, “for this portion of the Streeterville community, which is increasingly dominated by dense and boxlike high-rises.” Indeed Prentice’s structurally unique cantilevered concrete shell is an architectural asset in the neighborhood. It is the only hospital Goldberg designed for his hometown, and its quatrefoil plan emerged from his belief that architecture should strengthen community through human relationships. The worldwide list of architects calling for its preservation shows Prentice continues to bring the design community together, almost 40 years later.